For other people named Martin Lawrence, see Martin Lawrence (disambiguation). Martin Fitzgerald Lawrence (born April 16, 1965) is an American stand-up comedian, actor, producer, talk show host, and writer. 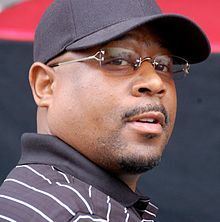 Lawrence came to fame during the 1990s, establishing a Hollywood career as a leading actor, most notably in the Fox television sitcom Martin and the films House Party, Boomerang, Bad Boys, Wild Hogs, Nothing to Lose, Blue Streak, Life, Big Momma's House and A Thin Line Between Love & Hate. The fourth of six children, Martin Fitzgerald Lawrence was born on April 16, 1965, in Frankfurt, West Germany, to American parents. His father, John Lawrence, was serving in the U.S. military at the time. Lawrence was named after civil rights leader Martin Luther King Jr. and U.S. President John F. Kennedy. When Lawrence was seven, his father left the military and the family moved from Germany back to the United States, settling in Landover, Maryland, in the Washington, D.C., area. After his parents divorced in 1973, Lawrence rarely saw his father, who was a police officer. His mother, Chlora (née Bailey), worked several jobs, including as a sales representative and cashier at various department stores, to support her family. During his teen years, Lawrence excelled at boxing. While living in Maryland, he attended Eleanor Roosevelt High School and also Friendly High School, and lived in Apple Grove, becoming a Mid-Atlantic Golden Gloves boxing contender. Lawrence ended up moving to New York City and found his way to the legendary The Improv. Shortly after appearing at The Improv, Lawrence won a performance spot on Star Search. He did well on the show and made it to the final round, but did not win. However, executives at Columbia Pictures Television saw Martin's performance and offered him the role of Maurice Warfield in What's Happening Now!! ; this was his first acting job. Upon cancellation of that show, Lawrence found bit parts in various films and television series. His breakthrough role was as Cee in Do the Right Thing. Other roles followed in films such as the House Party series, Talkin' Dirty After Dark, and the Eddie Murphy vehicle Boomerang. During this period, entertainment mogul Russell Simmons selected him to host the groundbreaking series Def Comedy Jam on HBO. Def Comedy Jam gave many comedians (including Chris Tucker, Dave Chappelle, Mike Epps, Bernie Mac and Cedric the Entertainer) mainstream exposure. During his stint with Def Comedy Jam, Lawrence appeared in his own hit series, Martin, which aired on Fox. The show ran from 1992 to 1997 and was an enormous success. Martin was the flagship of Fox's Thursday-night line-up, which drew millions of viewers away from NBC's "Must See TV" line-up. He hosted Saturday Night Live on February 19, 1994, where he made crude remarks about women's genitalia and personal hygiene; the monologue was completely edited out of NBC reruns and syndicated versions, and Lawrence was banned from the show for life. Martin's ratings continued to skyrocket so much that Fox became more of a contender against NBC and came closer to being considered among the top television networks. After Martin ended its run in 1997, Lawrence found work in comedy films. He often starred as the second lead opposite actors including Eddie Murphy, Danny DeVito, and Tim Robbins. Many of his films were blockbusters at the box office, including Nothing to Lose, Life, Blue Streak, and Big Momma's House. He also starred in critical- and box-office failures, including Black Knight and National Security. Regardless, his salary steadily increased to over $10 million per film role. He continues to work in film, with such films as Big Momma's House 2, which opened at No. 1 at North American box office and grossed almost $28 million its first weekend, and Wild Hogs (2007), in which he played a bored suburbanite seeking adventure on the open road in a biker comedy alongside John Travolta, Tim Allen and William H. Macy. In 2006, Lawrence appeared on Inside the Actors Studio, during which Lawrence briefly brought back to life some of the characters he had portrayed on Martin. He also appeared in Open Season as Boog, one of the main characters of the film. The movie also starred Ashton Kutcher, Debra Messing, and Gary Sinise. In 2008, Lawrence starred in Disney's College Road Trip co-starring with Raven-Symoné. It was his first G-rated film, but not his first appearance in a children's film: he supplied a voice for Open Season (2006) opposite Ashton Kutcher. At the 2009 BET Awards he appeared in a spoof movie trailer with Jamie Foxx for a fictional movie, The Skank Robbers, that featured their respective television characters Sheneneh Jenkins and Ugly Wanda. In 2010, Fox announced that it was producing a film based on the sketch, featuring Foxx, Lawrence, and actress Halle Berry. In 2011, Lawrence reprised his role as FBI agent Malcolm Turner in Big Mommas: Like Father, Like Son, the third film in the Big Momma series. In January 2013, it was announced that Lawrence and Kelsey Grammer are considering pairing up to star in a comedy for Lionsgate TV. The series will likely follow the same production model as Charlie Sheen's Anger Management, which is also produced by Lionsgate TV. That show was recently given a hardy back-90 pickup following its initial 10-episode order. Partners, pairs the two actors as Chicago lawyers from "vastly different backgrounds who unexpectedly meet in court on the worst day of their lives," according to a network description. The show premiered August 4, 2014. It was cancelled after one season after receiving poor reviews. Lawrence was engaged to actress Lark Voorhies in 1993. He married Miss Virginia USA, Patricia Southall, in 1995. Lawrence and Southall have a daughter, Jasmine Page (born January 15, 1996). They divorced in 1997. In 1997, Lawrence began a relationship with Shamicka Gibbs. They married on July 10, 2010, at Lawrence's Beverly Hills home. Actors Eddie Murphy and Denzel Washington were among the 120 wedding guests; Lawrence and Gibbs have two daughters, Iyanna Faith (born November 9, 2000) and Amara Trinity (born August 20, 2002). Lawrence filed for divorce from Gibbs on April 25, 2012, citing irreconcilable differences and asking for joint legal and physical custody of the children. Lawrence owns a farm near Purcellville, Virginia. For several years, he owned a large mansion in the Beverly Park community in Beverly Hills, where he wedded Gibbs. However, following their divorce, the property was available for lease at $200,000 per month in June 2012. In 2013, the property was up for sale for $26.5 million, and eventually he sold it for $17.2 million to Bruce Makowsky, buying an Encino, Los Angeles property for $6.63 million. In July 1995, while on the set filming A Thin Line Between Love and Hate, Lawrence lashed out in a violent rage and was then hospitalized at Cedars-Sinai Medical Center. On May 8, 1996, he became increasingly erratic and was arrested after he brandished a pistol in the middle of an intersection on Ventura Boulevard in Los Angeles, screaming, "They're trying to kill me!" He was again hospitalized, with his public-relations agent citing exhaustion and dehydration as the reasons for this episode. In January 1997, Lawrence's Martin costar Tisha Campbell filed a lawsuit against him, alleging sexual harassment and abuse both on and off set. By April 1997, Campbell had settled the lawsuit, and returned to appear in the last two episodes of the series. In March 1997, Lawrence was arrested after punching a man in a Hollywood nightclub. During August 1999, Lawrence slipped into a three-day coma after collapsing from heat exhaustion while jogging in 100-degree Fahrenheit (38 °C) heat in preparation for Big Momma's House while wearing heavy clothing and a "plastic suit." He recovered in the hospital after nearly dying due to a body temperature of 107 °F (41.7 °C), his breathing assisted by a ventilator. ^ "Martin Lawrence Biography – Yahoo! Movies". Yahoo! Movies. Retrieved March 26, 2007. ^ "Martin Lawrence Biography (1968–2015)". Filmreference.com. Retrieved February 1, 2012. ^ "Martin Lawrence – Profile, Latest News and Related Articles". E! Online. Archived from the original on September 27, 2007. Retrieved March 26, 2007. ^ "Chlora Lawrence-Crandell" Archived April 26, 2012, at the Wayback Machine. The Transylvania Times. ^ Duffy, Mike (August 26, 1992). "Comic parlays stand-up act into sitcom". Knight-Ridder Newspapers. The Tampa Tribune. p. 4. ^ "Yahoo! Movies – Weekend Box Office and Buzz". Yahoo! Movies. Retrieved March 26, 2007. ^ "'Skank Robbers': Jamie Foxx, Martin Lawrence to reprise drag roles". Catch. October 11, 2010. Archived from the original on October 13, 2010. ^ Heritage, Stuart (November 10, 2010). "Big Momma's House 3: once, twice, three times a fake lady". The Guardian. ^ Nicholson, Max (January 3, 2013). "Kelsey Grammer and Martin Lawrence Teaming Up?". IGN. San Francisco, California: j2 Global. Retrieved April 25, 2019. ^ "Martin Lawrence & Kelsey Grammer In 'Partners': Critics Slam New Series". Hollywood Life. August 5, 2014. Retrieved April 25, 2019. ^ Wihlborg, Ulrica (July 10, 2010). "Martin Lawrence Ties the Knot". People. Retrieved July 10, 2010. ^ "Martin Lawrence Files for Divorce". TMZ. April 30, 2012. Retrieved May 1, 2012. ^ Laudidio, Marisa (April 24, 2012). "Martin Lawrence and Wife are Divorcing". People. ^ The Reliable Source (August 7, 2009). "Hey, Isn't That...?". The Washington Post. ^ "Geese Give Martin Lawrence a Goose". TMZ. July 31, 2008. ^ David, Mark (June 15, 2012). "Martin Lawrence To Let Bev Hills Mansion". Variety.com. Retrieved April 16, 2019. ^ David, Mark (June 20, 2013). "Martin Lawrence Downsizes in Encino". Variety.com. Retrieved April 16, 2019. ^ Lang, Steven (May 12, 1997). "Disorderly Conduct". People. Retrieved November 26, 2011. ^ "Tisha Campbell Files Sexual Harassment Lawsuit Against Martin Lawrence". Chicago, Illinois: Johnson Publishing Company. January 27, 1997. Retrieved March 15, 2018 – via Google Books. ^ "Martin Lawternce Ends Sitcom, 'Martin', In Fifth Season". Jet. Chicago, Illinois: Johnson Publishing Company. April 28, 1997. Retrieved March 15, 2018 – via Google Books. ^ Metcalfe, Coll (August 26, 1999). "Actor Martin Lawrence Comes Out of Coma". Los Angeles Times. Retrieved July 3, 2015.